Do you enjoy running? I've never been a huge fan but have always wanted to be...Maybe someday. 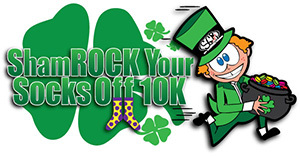 The Shamrock 10k is on March 19th at 9:00 am. Registration ends on March 16th. This race will start in Snow Canyon State Park and goes through neighborhoods until it ends at the Ivins City Park. Location: Meet at the Ivins City Park the buses will leave between 7:30 and 8:15 to take the runners to the starting line at Snow Canyon State Park.